"Raila Odinga was at the Center of 2007-2008 post-election Violence." Says President Uhuru Kenyatta in Kisii. - Bana Kenya News, Real African Network Tubanane. Home featured News "Raila Odinga was at the Center of 2007-2008 post-election Violence." Says President Uhuru Kenyatta in Kisii. "Raila Odinga was at the Center of 2007-2008 post-election Violence." Says President Uhuru Kenyatta in Kisii. The president Uhuru Kenyatta end his tour in Kisii after he awken the forgotten and burning 2007-2008 Post-Election violence. The Kisii area was highly affected and today they are Internally displaced people(IDPs). The President said so after the decisions made by the advisors as Kisii is the only jubilee block in Western region. 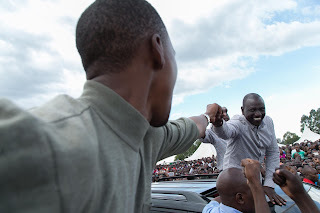 The president said that the ODM leader Raila Odinga was the man at the centre of the violence. The deputy president did not have any effort in the violence. The two leaders also claimed that they took their son as Cabinet secretary for Education and it will be good for them to vote them back so the son continues to be Education CS. The Jubilee leaders also urge that when the NASA approaches them to refuse because the ODM leader is yet to visit the area next month. The opposition supporters clash with their counterpart following the statements that were given by the President about the post-election violence. The president had to wind up the tour in the Western Region and come back to Nairobi. It is speculated that the Region is an opposition zone and the awakening statements were not welcomed by residents as they are still IDPS who have not yet been settled.